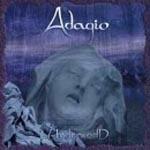 Review: "Adagio: Underworld" - Sea of Tranquility - The Web Destination for Progressive Music! The sophomore release from Adagio is a powerful and engaging slice of progressive metal, heavy on instrumental virtuosity, memorable neo-classical melodies, and epic arrangements. Borrowing from influences such as Symphony X, Yngwie Malmsteen, Dream Theater, and early Rainbow, Adagio prove that their debut was no fluke, as Underworld is even more coherent and professional sounding in every aspect. Those into epic, symphonic- laced progressive metal tunes are in for a real treat here. The opening cut, "Next Profundis" is complex piece that lets guitarist Stephan Forte and keyboard player Kevin Codferi really shine, as each wraps lightning quick unison lines around each other while bassist Franck Hermanny and drummer Dirk Bruinenberg lock into some heavy grooves. Singer David Readman has a voice that is similar to former Yngwie Malmsteen singers Mark Boals and Jeff Scott Soto, and his pipes lead the way on the intense "Introitus/Solvet Saeclum in Savilla", an eight-minute, crunchy affair that features heavy guitar riffs from Forte and nimble synthesizer leads from Codferi. To call this a neo-classical metal gem would be an understatement! The band approaches speedy Stratovarius territory on the double-bass drum attack of "Chosen", which despite it's reliance on speed still packs in plenty of catchy melodies thanks to the strong vocals of Readman. Codferi is really a talent, as his dizzying leads on this track will cause your jaw to slowly drop to the floor in amazement. He's also all over the impressive "From My Sleep�To Someone Else", and angry tune that is showered with the keyboard player's majestic piano and orchestral synths. Singer Readman portrays the bleak lyrics perfectly "�And by the dawn I'll know, if I rest in my sorrow, to burn, to shout, I will not live this life forever. I am, you are me, I am my own enemy, but for no long I'm sure, I'll seek the final cure", by somehow giving it a melodic hook that reels the listener right in. The epic title track is just under 14-minutes, and comes across like a grand motion picture soundtrack, complete with huge orchestral arrangements and choirs. Fans of Symphony X's album V will eat this tune right up. Forte's massive riffs and impressive lead work give this tune an ominous tone to go along with all the histrionic arrangements, and Readman once again gives a fantastic performance. It's here that Adagio show their true mettle, as they shift from symphonic power, to brutal complexity, to majestic atmosphere, all at the drop of a hat. "Promises" give the band a chance to display their soft, acoustic side, while "The Mirror Stage" is an ultra complex prog-rock romp complete with intricate guitar riffs, blinding synth passages, and husky vocals. The closing instrumental "Niflheim" is a neo-classical metal tour-de-force, as the four players weave intricate melodies and complex rhythms over huge walls of orchestrations. Adagio is a special band, and there's no doubt that Underworld will help them gain a foothold in the progressive metal world. Each musician in this band is a unique talent, and together they make for one hell of an ensemble. Recommended! This album blows my mind.This is like listening to Divine Wings.. from Symphony X but with the symphonic cuotient higher.Every member stands out, but the keyboards steals the show.Beautiful music(kind of soundtrack-like in several places)! I will be hard pressed to find any criticism of how they could do it better. Do you understand what i'm saying to you? The album of the year so far for me. The Review tells the whole story.